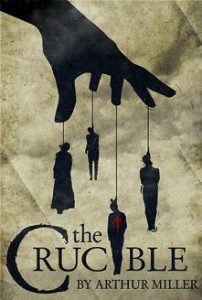 The Crucible is Arthur Miller’s dramatization of the Salem Witch Trials of 1692/93. Set in Salem, Massachusetts, the play enacts the hysteria and irrational hunt, trial, and execution of innocent people caught up in a personal and superstitious web of accusations. Miller wrote the play as an allegory of the House of Representatives Committee on Un-American Activities led by Joseph McCarthy. Miller was convicted of Contempt of Congress for not releasing the names of people he met with during private meetings. The setting is in Salem, Massachusetts in 1692. The opening scene is the home of Parris, a local priest. His daughter Betty appears seriously ill and is lying on her bed unconscious. Parris caught Betty just the previous night, about the midnight hour dancing in the woods with another young woman, Abigail, who is his niece, and Tituba, the black slave he owns. A local doctor has not been able to determine what is wrong with Betty. As Mr. and Mrs. Putnam arrive, they explain that their young daughter Ruth has also fallen ill. We hear of talk throughout the village that the cause of these illnesses is of an unnatural origin. Meanwhile, Parris’s niece Abigail tries to persuade her friend Mercy Lewis, as well as Mary Warren, who is working as the servant to the Proctors, not to betray the fact that they were all in the woods casting spells. Betty wakes. Abigail threatens violence to anyone who reveals that she drank blood in order to cast a spell to kill Goody Proctor. At this, Betty lapses back into unconsciousness. During a private conversation between John Proctor and Abigail we get details about their former relationship. While Abigail worked as a servant in the Proctor home, Elizabeth Proctor became ill. As a result, Abigail took on more responsibility in the home and took on a larger role. We learn that during this time a relationship developed between John Proctor and Abigail. When Elizabeth Proctor regained her health, she dismissed Abigail. At this point Abigail is angry because John will not acknowledge his feelings for her. Betty wakes again and becomes hysterical. She is calmed by Rebecca Nurse. Rebecca is well-respected and during this visit she warns Parris that naming witchcraft as the cause of Betty’s illness will set dangerous things in motion in Salem. At this, Mr. Putnam asks Rebecca to visit Ruth and attempt to wake her. We find out that Ruth is the only surviving child of the Putnams, as the seven others died in infancy. Because of this, we also find out that Mrs. Putnam is jealous of Rebecca because all of her children survived and are healthy. To further complicate relationships, Putnam, Proctor, Parris, and Giles Corey get involved in an argument over business matters. Parris believes that there are people allied to drive him out of Salem. Putnam, Proctor, and Corey argue over property lines and property ownership. Putnam accuses Proctor of taking wood from the land that he does not own. In response, Proctor claims that the land was rightfully purchased from Francis nurse five months prior, to which Putnam claims Francis did not have a legal deed of ownership to sell the land. Things become complicated as Reverend Hale arrives in order to investigate the strange happenings and sicknesses in Salem. He has been summoned by the people of Salem who fear that witchcraft is behind the illnesses. Hale finds out that the afflicted girls were in the woods dancing together with Tituba. He believes Tituba is capable of conjuring spirits. At this the girls begin to blame each other. Abigail puts the blame on Tituba who admits that she is capable of conjuring spirits. When Hale questions Tituba she explains that she has seen the devil himself. Tituba tells Hale that Goody Good and Goody Osborn have also seen the devil. When Betty finally wakes up she lists all who have seen the devil. Eight days pass and Elizabeth and Proctor argue over that fact that she found out Proctor spoke with Abigail privately in Salem. After serving in the court, Mary Warren returns home to Salem. She gives Elizabeth a doll she made while sitting in the courtroom. Mary Warren explains to Proctor that some of the girls accuse Elizabeth of witchcraft. However, the charge is dismissed by the court after she is defended by Mary Warren. Hale turns his questioning on the Proctor house and asks Proctor about his poor attendance at church. As a test, he asks Proctor to name the Ten Commandments. Proctor names nine of them correctly but seems to forget the commandment against committing adultery. Hale also questions Elizabeth. Proctor admits that Abigail told him the witchcraft allegations are false. Marshal Herrick arrives. He arrests Elizabeth after Abigail feels a needle stab earlier in the evening and accuses Elizabeth of attempting to murder her. The authorities of Salem search the Proctor home and find the doll Marry Warren had given Elizabeth. They also find a needle. After Hale questions Mary Warren, she admits that she sewed the doll and put the needle inside it. She tells Hale that Abigail saw her sew the doll and also saw her place the needle inside. Nevertheless, he has Elizabeth arrested. Martha Corey and Rebecca Nurse are convicted of witchcraft. However, Giles Corey explains to the court that he can prove that the accusations are based on Proctor’s scheme to gain more land and that the charges are false. Judge Danforth demands that Corey reveal the source for his claims and he refuses to give over the name. Corey is arrested. At this, Judge Danforth tells Proctor that Elizabeth is pregnant. The court proceedings involve the girls making accusations toward each other. Mary Warren tells the court that she lied and pretended to see spirits. She admits that her accusations against the others are false. She also tells the court that Abigail and the other girls are also lying. Abigail denies this. She and the other girls accuse Mary of using spirits against them in the court. Proctor calls Mary a lying whore and denounces the charges against Mary Warren. Proctor admits his affair with Abigail to the court. He also states that Abigail is lying to the court in order to get Elizabeth executed so she can marry Proctor. He goes on to state that Elizabeth would never lie. The court summons her and questions her. She is unaware that her husband has already admitted to the affair and she lies to the court. She is sent back to jail. Abigail continues to accuse Mary Warren of attacking her. Mary Warren eventually recants her confession. She says she lied about the witchcraft and she accuses Proctor of being in league with the devil. After several months, we find Proctor in prison, as is Rebecca Nurse, awaiting execution by hanging. Elizabeth’s execution has been delayed until she gives birth, but she too waits in prison. Proctor confesses all and signs a written confession. However, he cannot bear to have the confession made public and decides to take the guilt with him to the grave. He destroys the affidavit rather than see it posted on the church. The play ends as we hear the drum beats as he is taken to the gallows. A farmer who lives just outside of Salem. He serves as the voice of reason in the play yet he is compromised by a scandalous secret. He is the one who exposes the girls and their lies about practicing witchcraft and for this reason he is the tragic hero in the play. But because of his affair with Abigail, he questions his own moral standing in the community. In the end he cannot take a final stand for justice and gives himself over to the gallows. The wife of John Proctor. She shares her husband’s strict moral and religious views. She has a confidence in her morality. She believes there through strict adherence to these moral and Christian principles a person can maintain their principles even when those principles conflict with strict Christian doctrine. Because she is considered to be of such high moral character, this very quality is what ultimately gets her husband condemned when she lies about his affair with Abigail. However, Elizabeth comes over as cold and demanding and we are led to suspect that this demeanor is what may have led her husband to have an affair with Abigail. The seventeen year-old niece of Reverend Parris. Abigail was a servant to the Proctors before she was let go by Elizabeth for having an affair with her husband John. She seems malicious and vengeful in the play. It is Abigail who creates the hysteria over witchcraft after she is caught dancing by Reverend Parris. She wrongfully accuses the others of witchcraft to cover herself from charges. She also charges Elizabeth Proctor of witchcraft in order to take her husband. We learn that much of her vicious nature is largely due to childhood trauma. She was orphaned after watching her parents murdered by Indians. As the Deputy Governor of Massachusetts, he presides over the Salem witch trials. He is cold and stern man, more interested in preserving the dignity of the court than in justice or fairness. He adheres to the rule of law over any considerations for real justice or fairness. To this end, he is a figure of irrationality in the play. He equates the accusation of witchcraft with guilt. He is made ineffective as he attempts to compel John Proctor to sign a confession to avoid execution, thus preserving the dignity of the court. When Proctor defies him and willingly goes to the gallows, the irrationality of the law is made exposed. A paranoid and fearful man, Parris sets much of the witchcraft hysteria in motion after he finds his daughter and niece dancing in the woods with the other girls. He is paranoid and continually afraid that others will conspire against him. He knows that Abigail is lying about witchcraft but he perpetuates this lie because he sees it as in his own self-interest. He perceives any attack of the charges of witchcraft as an attack on the court and on him. He seeks personal aggrandizement and monetary gain through the acquisition of property in the form of the preacher’s house. Hale is a scholar who comes to Salem for Beverly at the request of Reverend Parris in order to investigate charges of supernatural activity and witchcraft. His approach is rational and intellectual. He believes he can explain these events in purely rational and natural terms. Though initially enthusiastic about the events in Salem, he soon grows tired of the accusations and eventually defends Proctor. He goes so far as to challenge the allegations from Abigail, largely out of a sense of guilt for the potential wrongful conviction of Proctor. Something of a comic figure in the play, Corey is known for having brought numerous suits to the court. He may have unwittingly fanned the flames of the witchcraft hysteria by wondering aloud at the strange things his wife had been reading. However, he remains on the side of Proctor and defends him against the charges of the girls. He believes that it is Thomas Putnam who caused the charges to be filed in order to secure land. He refuses to name this in court and he is killed when the court weighs him down with stones in order to force him to tell what he knows. The servant in the Proctor household, eighteen year-old Mary is found dancing in the woods with the other girls. She is a weak person and easily influenced by others. Although she defies the Proctors by going to court to testify against Abigail, she eventually breaks down when she is accused of witchcraft by Abigail. A black slave from Barbados, she was with the other girls when they were dancing and attempting to conjure the spirits of Ann Putnam’s dead children. She is the first person to be accused of witchcraft and she is also the one who first accuses the others. She readily accuses the other girls primarily to avoid her own punishment. Putnam is bitter and cruel man. He is one of the wealthiest landowners in Salem. He holds a series of grudges against the citizens of Salem, including the Nurse family who he believes blocked the appointment of his brother-in-law to a position as minister. He compels his daughter to move forward with an accusation of witchcraft against George Jacobs because if Jacobs is executed, Putnam would be in a position to buy his land. An elderly woman and a figure of sanity and purity. She is the one who suggests that Betty’s illness is simply a matter of being out in the cold. But since she was a midwife, she is an easy target of the charge of witchcraft and responsible for the unnatural deaths of the Putnam children. She is clearly a martyr in the play; an innocent wrongly hanged for witchcraft. The presiding judge over the Salem witch trials. He is largely under the sway of Deputy Governor Danforth. He applies the same irrational logic as Danforth during the course of the trial. The husband of Rebecca Nurse. He is a well-respected land owner in Salem. He joins Corey and Proctor in the challenge to the court after their wives are charged with witchcraft. The teenaged daughter of Reverend Parris. She falls ill after the night of dancing in the woods with the other girls that leads to the accusations of witchcraft. She falls into delusions after the charges are brought, claiming she can fly and she reacts in horror at the mention of the name of Jesus. This lends the air of the supernatural which drives the hysteria onward. The first person to be charged with witchcraft. She is homeless and she joins Tituba in fanning the flames of the witch hunt largely to save herself. She takes on a comic quality when she claims that Satan will save her and Tituba and take them to Barbados. Wife of John Putnam. She believes the deaths of her infant children were due to supernatural causes. The Crucible deals with the idea of living under a single over-riding system of belief which excludes everything else. Because the play is set in Puritan colonial America, we see how this oppressive system of belief can exclude any thought of meaningful justice, of mercy, or even of rational argument. The only thing that matters is the law of Puritan religious belief. As facts are brought to the court, for example, all mitigating factors such as a character’s intentions or the likely cause of the problem are ignored because the religious law that is in force judges according to strict definitions of right and wrong. This leads to injustice and cruelty. The play completely turns on unsubstantiated allegations which play on either fear of personal motives. Once these fears and prejudices are set in motion, a general hysteria captures everyone involved. Thus we see how a crowd hysteria can cloud out things like rational judgment. It is hysteria which leads characters to wrongly accuse one another. Hysteria also over-shadows the judgments of court officials. It is important to remember that Miller wrote this play against the backdrop of the hunt for Communists in American society. The so called “Red Scare” that fueled injustice in American society is played out in this play. The dual themes of intolerance and hysteria were largely what drive the McCarthy Hearings in the United States in early 1950s which led to the ruin of many people. Miller’s play does not shy away from the political climate in which it was written and performed. Spoken by Abigail in Act I, these lines show us the intense feeling she still holds for John Proctor. She is so intent on her feelings for John, and so intent on not recognizing that he sees her as a mistake, that she will not listen to any reason regarding their relationship. For him it is over and he wishes only to re-build his life with his wife. For her, it is a madness and a delusion that she and John will be together. These lines also demonstrate her intense disregard for the entire town of Salem. This is an outburst from Abigail in Act I. She reacts to Tituba’s admission to conjuring spirits and sees this as her way out. By making this histrionic declaration she disavowals her own responsibility and defers the blame for evil deeds onto the other girls. From this we can see just how manipulative and duplicitous Abigail can be. These are the words of Danforth in Act III. We see here Danforth’s believe that there is only the rule of the court. What is right is determined by religious law and any other consideration is on the side of evil. We also recognize in these lines the strict belief in being with the authorities or against them. Danforth says the time is past when “evil mixed itself with good.” There are no grey areas. From Act III when Proctor finally breaks down and speaks on behalf of truth and justice. Here he confesses his sins and his affair with Abigail, and by doing, he exposes her lies regarding the accusations of witchcraft. He draws attention to the hysteria which surrounds the trial and states that the proceedings are a “whore’s justice.” The court and trials are a “whore” to special interests and Abigail seeks favor even though she is a whore. The witch hunt is perhaps the most significant symbol in the play. The because the play deals with historical problems that attend the House Committee on Un-American Activities and the hunt for communists in American society, the entirety of the witch hunt stands as symbol for this series of events. As the play enacts the hysterical and authoritarian practices of Puritan Salem, so the country was led by an analogous set of irrational motivations and authoritarian methods. The communist witch hunt destroyed people in the United States unjustly just as the witch hunt in the play ends with hanging innocent people. Inspired by the McCarthy hearings in the early 1950s, The Crucible is an indictment of authoritarian rule led by hysterical motives. Miller based the play on the Salem Witch Trials of the 1690s, which he had studied. By setting the play in Puritan Colonial America, Miller is able to create the oppressive atmosphere which he saw in the McCarthy hearing and the red scare that fueled them. The problem of irrational belief which over-rides justice and decency is at work in both the witch trials and the red scare. By situating his indictment in the 17th century, Miller is able to dramatize the superstition and irrationality of the McCarthy hearings.